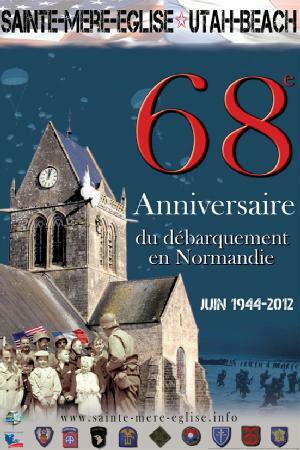 Today June 6th, 2012, France is commemorating the 68th anniversary of D-Day. We are remembering and honoring the brave American soldiers that gave their lives for Freedom and changed the course of history. There will be a concert for Peace tonight at Sainte-Mère-Église (the first town liberated) at 20h30 (8:30 PM). For more information in English on Sainte-Mère-Église in Normandy, you can visit their Office of Tourism at Sainte Mère Eglise et ses histoires. And for President Eisenhower’s speech to his troops before the embarked for this brave journey, check last year’s 67th D-Day commemoration. So let’s talk about history and the sacrifice these young men and women did with our younger generations so we always remember and never forget!